I've been wanting to take Shane to a nearby park and try to get some current pictures of him. Some of the pictures turned out really cute. Kenny actually is going to submit a handful of them to someone at his work that is looking for a picture of a kid in a natural setting for a sign she is making for a project. It would be really cool if they used one of the pictures of him. This morning I took Shane to his 1st concert at a park in Kirkland. The musician this week was Jim Valley . I grew up listening to him when I was in elementary school. He visited our school two years in a row, too and was a huge hit. I was really excited to see him again and to take Shane. Shane had other plans though. He didn't think sitting and listening to some guy sing was all that exciting. He lasted about 1/2 of a song and then was ready to go. We then just picked up our stuff and walked around the area so at least I could still hear the music and Shane could move around. We bought a CD though so no matter what I'll make him listen to it in the car. Shane was having a really tough night tonight...he was really tired really early on, SOOOO Kenny let him into the "pantry". That sure changed Shane's mood. As you can see he had a lot of fun taking everything out. Heck...it needed to be reorganized anyways. He is waving in the first picture...one of his new skills that just cracks us up. He also is really big into nodding his head yes or no. Today I actually think he answered me with a head nod yes when I asked him if he was done with his milk. That blew me away! We took Shane to the zoo today. It was his 2nd time to a zoo. 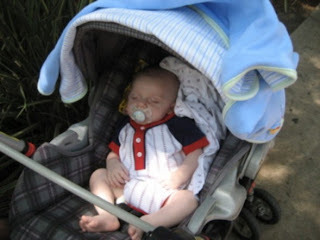 I took him to the San Diego zoo when he was about 2 months old right before we moved (not that he remembers that at all!). This was Kenny's 1st time to the Woodland Park Zoo. I can't say that Shane was extremely excited to be there. He enjoyed being out, but most of the exhibits didn't do much for him. It was hard for him to see a lot of the animals and I just don't think he is old enough to really get the concept of what we were doing. The big hits of the day were playing on an old tractor in the barn yard area and petting the goats and a rabbit named Harvey in the petting zoo. Kenny and I enjoyed seeing the Brown Bear swim in the water right next to the glass, a giraffe looking right down at us during feeding time, the Gorillas looking like they were meditating, and the elephants getting a bath. Just a little update on a few happenings over the last week or so. Myself and two of my crafty neighbors tried out a craft fair/farmers market event last Sunday. It was quite an experience. I can't say we sold much, but it was interesting to have your items up for sale and to have everyone browse and comment on them. And even more entertaining to watch everyone at the event. We think we will give another one a try come the holiday season. My little vegetable garden has actually produced veggies!! I have harvested my lettuce plant 3 times now and it continues to grow more. I have two baby green tomatoes on my tomato plant and I just picked 5 snap peas from my snap pea plant. I'm just amazed by it all! I do have a cucumber plant that is still alive, but have yet to see anything on it. It is the one in the middle of the lettuce plant and the tomato plant. We returned today from a 5 day camping trip (Shane's first). We left on Friday July 4th to drive about 5 hours to Moscow, Idaho for the night. That is where Kenny went to college at the University of Idaho. We walked the campus and saw some of the places that he used to frequent in college. Saturday morning we headed out for Warm Lake which took us another 5 hours to get to our campground. We drove through areas that I had never seen before. Shane was a pretty good traveler. He didn't think napping was very important while in the car (or while camping for that matter), so he was awake for almost all of the driving. We were meeting up with about about 8 other families. It was a big college reunion for Kenny. Most of these people I had only heard of or met briefly, so it was a lot of fun to get to know all of them better and put faces to names and stories. Kenny had a great time seeing all of his friends and meeting their kids. Shane had a lot little buddies and dogs to to play with. We spent time hanging out and talking to everyone during the day and spent late nights by the fire. On Monday Kenny went rafting with all the guys. Tuesday most of the girls went, but I opted out of that adventure. There was a little sandy beach that we walked to most days and played in the water to help cool us off. The weather was great, maybe a little hot during the middle of the day, but the evenings cooled off nicely. This was full-on camping too....no showers, sinks or flush toilets!! At one point I thought maybe my back had gotten burnt because it itched really bad, Kenny said it looked tan, but that maybe it was just dirt?! It was wonderful to come home (after driving 10.5 hours straight) and take a hot shower. Kenny and Shane on the campus of the University of Idaho. Our tent site: the sun hit it all afternoon...it got really hot inside the tent...probably why Shane didn't take naps too well while camping and of course he didn't want to miss out on any of the fun. Shane with Jason and Jo's little puppy Lilah. He loved giving all the dogs kisses and all the dogs would give him big kisses back. Shane's favorite toy was a tractor that Ethan brought. He would make the best motor noises when playing with it!! This is looking down from our tent site to the central location of our camping area. It was perfect because everyone had their own site and space around this, but then there was this huge structure that we could all hang out in and eat together. The pool is fun even with out water in it (Shane and Xalen). Jessica and Shane sitting in the rocking chair on the last day of camping.